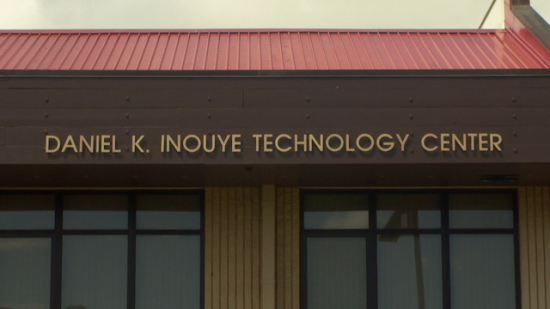 LIHUE, Hawaii — The dedication and blessing of Kauai Community College’s Daniel K. Inouye Technology Center took place on Oct. 18. The 18,000-square-foot center is the home of electronics labs: Cisco Academy Netwworking Lab, Photonics Lab with laser and optics, and the Hawaii Space Flight Lab. Inouye, who died last December, was key in the creation and equipping of the Photonics and Optics Lab and in supporting the Hawaii Space Flight Lab. The blessing was conducted by Kahu Nani Hill of the Hanapepe Hawaiian Congregational Church. The late senator’s wife, Irene Hirano Inouye, and son, Ken Inouye, joined Chancellor Helen Cox in the ceremony. “One of my father’s biggest things was always the concept of each generation trying to make it such so that the next generation is able to have the resources and knowledge to help fulfill their fullest potential,” said Ken Inouye. Community partners, government and University of Hawaii officials, graduates of the Technology Education program, and Kauai Community College’s faculty, staff, and students also attended. Kauai CC’s Hawaiian studies students and instructor Puali’ili’imaikalani Rossi will paid tribute to Inouye and his family with an oli and hula. Faculty members who currently lead the programs of study offered in the center — Georgeanne Friend, Mark Anderson, and recently retired faculty member Francis Takahashi — presented remarks on Inouye’s support of the college’s role in advancing technology in the Pacific, and current and future projections of the programs. Guests were given tours of the center.